Recent work by us and others now appears to offer a radically different insight into the relation E=mc2, as well as into the very idea of mass itself. To put it simply, the concept of mass may be neither fundamental nor necessary in physics. In the view we will present, Einstein’s formula is even more significant than physicists have realized. It is actually a statement about how much energy is required to give the appearance of a certain amount of mass, rather than about the conversion of one fundamental thing, energy, into another fundamental thing, mass. Indeed, if that view is correct, there is no such thing as mass-only electric charge and energy, which together create the illusion of mass. The physical universe is made up of massless electric charges immersed in a vast, energetic, all-pervasive electromagnetic field. It is the interaction of those charges and the electromagnetic field that creates the appearance of mass. In other words, the magazine you now hold in your hands is massless; properly understood, it is physically nothing more than a collection of electric charges embedded in a universal energetic electromagnetic field and acted on by the field in such a way as to make you think the magazine has the property of mass. Its apparent weight and solidity arise from the interactions of charges and field. Besides recasting the prevailing view of mass, this idea would address one of the most profound problems of physics, the riddle of how gravity can be unified with the other three fundamental forces of nature. The electromagnetic force and the weak force, which is responsible for nuclear decay, have been shown to be two manifestations of a single force, appropriately called the electroweak force. There are tantalizing hints that the strong force, which binds nuclei together, will someday be unified with the electroweak force. But until now gravity has resisted all attempts at unification. If the new view is correct, however, gravity would not need to be separately unified. Just as mass would arise from the electromagnetic force, so would gravity. What is mass? Two key properties define the concept of the mass of a given amount of matter, namely, its inertia and the gravitation to which the matter gives rise. Inertia was defined by Galileo as the property of matter that keeps an object in uniform motion once given an impetus, until the object is acted upon by some further impetus. Galileo’s idea was generalized and quantified by Newton in his Principia. The tendency of an object to remain in uniform motion, and the tendency of the motion to change when impetus is applied, Newton expressed in one compact equation. The equation states that the acceleration a, or change of velocity, is proportional to the force F applied, where the constant of proportionality is the inertial mass m of the object in question: thus, F=ma. In other words, inertial mass is the resistance an object offers to being accelerated when it is subjected to a force. In Newton’s equation of motion, when the application of a force ceases, the acceleration goes to zero, and the object remains in uniform motion. Objects are assumed to resist acceleration, because that resistance is an innate property of matter. Some 200 years later the nineteenth-century Austrian physicist and philosopher Ernst Mach took a contrary view. To Mach, Newton’s thought experiment demonstrated the absurdity of the idea of absolute space. The shape of the water in a rotating bucket, Mach held, was conferred, somehow, through the presence of all the other matter in the universe. Thus Mach agreed with Newton that the property of inertia creates the need for a reference frame; he simply disagreed that such a reference frame could exist as a distinct, absolute entity. Distant matter, however, could define the reference frame. Unfortunately, his conjecture, which has come to be known as Mach’s principle, remains more of a philosophical statement than a testable scientific proposition. In the early twentieth century a number of investigators, including Max Abraham, Hendrik Antoon Lorentz and Henri Poincare, suggested that inertial mass might arise from an effect called electrostatic self-energy. Any charged particle-the electron, for instance-possesses a certain quantity of electric charge. The charge is the source of an electric field, which carries energy-the electrostatic self-energy. It was proposed that the electrostatic self-energy might correspond to the inertial mass of the charged particle, through the equation E=mc2. But the theoretical mass of the electrostatic electron derived from the equation is many orders of magnitude larger than the actual observed mass of the electron, and the self-repulsion of the electrostatic forces would quickly disperse the electrostatic electron. Hence the theory fails. Our work suggests inertia is a property arising out of the vast, all-pervasive electromagnetic field we mentioned earlier, which is called the zero-point field (ZPF). The name comes from the fact that the field is held to exist in a vacuum-what is commonly thought of as “empty” space-even at the temperature of absolute zero, at which all thermal radiation is absent. The background energy of the vacuum serves as the reference, or zero point, for all processes. To understand how the ZPF might give rise to inertia, one must understand something about the nature of the field itself. Theoretical considerations indicate that the ZPF should be a background sea of electromagnetic radiation that is both uniform and isotropic (the same in all directions). The reader may already be familiar with a somewhat similar concept: the remnant radiation from the big bang. According to big bang cosmology, the universe began with a titanic explosion, which gave rise to hot, energetic radiation distributed throughout the infant universe. As the universe expanded and cooled, the radiation became much less energetic, but it still pervades space as a faint and nearly isotropic background of microwave radiation. Like the cosmic microwave background, the ZPF is a sea of radiation that fills the entire universe. There is a major difference, however. The cosmic microwave background has a rather feeble spectrum identical with the spectrum of an object in thermal equilibrium at a temperature of only 2.76 degrees Celsius above absolute zero. In contrast, the ZPF is a highly energetic emission whose predicted radiation spectrum departs radically from the spectrum of an object in thermal equilibrium. Instead of trailing off at high frequencies, the energy of the ZPF continues to rise sharply with the frequency of the radiation. Quantitatively, the energy density is proportional to the cube of the frequency; double the frequency, and the energy increases by a factor of eight. At what frequency the ZPF spectrum finally cuts off or loses its ability to interact with matter are important and still unresolved issues. A more profound difference between the cosmic microwave background and the ZPF is a result of the origin of the two emissions. When you switch on a lightbulb, the source of the light emission is clear; it is the heat produced by an electric current in the filament. The source of the cosmic microwave background can also be traced to known physical phenomena, namely, the heat radiation associated with the big bang, as modified by the later expansion and cooling of the universe. The origin of the ZPF is more esoteric. In fact, two distinct views about it exist today. The conventional view traces the ZPF to the laws of quantum mechanics, the theory forged early in the present century to describe the atom. Any electromagnetic field is characterized by the frequency, polarization and direction of propagation of its radiation. A set of values for those three quantities defines a single so-called mode of the field. Every possible mode can be populated by an arbitrary number of photons, the fundamental quanta of electromagnetic radiation. But according to the probabilities calculated in quantum mechanics, even at its minimum energy, each mode will contain one photon half the time and no photons the other half the time. In a field of zero energy each mode would, with certainty, contain no photons, but that is impossible because of the equal probability that each mode also contains one photon. Thus every mode acts, on average, as if it were populated with at least one-half photon (in addition to whatever other natural or man-made radiation happens to be present). All such modes add up quickly. Since the energy density of the ZPF increases as the cube of the frequency, the amount of energy making up the ZPF is enormous. That energy, in the conventional view, is simply forced into existence by the laws of quantum mechanics. Not surprisingly, it is regarded in quantum fashion as sometimes real and sometimes virtual, depending on the problem at hand. The competing theory for the origin of the ZPF comes from what has heretofore been an obscure discipline within physics known as stochastic electrodynamics, a modern version of much earlier twentieth-century investigations by Einstein, Max Planck, Walther Nernst, Ludwig Hopf and Otto Stern. Stochastic electrodynamics postulates that the ZPF is as real as any other radiation field. In such a view the existence of a real ZPF is as fundamental as the existence of the universe itself. The only difference between stochastic electrodynamics and ordinary classical physics is the single assumption of the presence of this all-pervasive, real ZPF, which happens to be an intrinsic part of the universe. One justification for making such an assumption is that by adding the ZPF to classical physics many quantum phenomena can be derived without invoking the usual laws or logic of quantum mechanics. It is premature to claim that all quantum phenomena could be explained by stochastic electrodynamics (that is, classical physics plus the ZPF), but that claim may one day turn out to be the case. In that event, one would have to make a choice. One could accept the laws of classical physics as only partly true, with a wholly different set of quantum laws required to complete the laws of physics; that is essentially what is done in physics now. Or one could accept the laws of classical physics as the only necessary laws, provided they are supplemented by the presence of the ZPF. Whether the ZPF arises from quantum laws or is simply an intrinsic part of the universe, an important question remains: Why do people not sense the presence of the radiation if indeed it is made up of real electromagnetic waves spanning the spectrum of radio waves, light and X rays? The idea that space could be filled with a vast sea of energy does seem to contradict everyday experience. The answer to the question lies in the utter uniformity and isotropy of the field. There is no way to sense something that is absolutely the same everywhere, outside and inside everything. To put the matter in everyday terms, if you lie perfectly still in a tub of water at body temperature, you cannot feel the heat of the water. Motion through a medium almost always gives rise to asymmetries, which then makes it possible to detect the medium. But in the case of the ZPF, motion through space at a constant velocity does not make the field detectable, because the field has the property of being “Lorentz invariant.” (Lorentz invariance is a critical difference between the modern ZPF and nineteenth-century concepts of an ether.) The field becomes detectable only when a body is accelerated through space. In the mid-1970s the physicists Paul C. W. Davies, now at the University of Adelaide in Australia, and William G. Unruh, now at the University of British Columbia, showed that as a moving observer accelerates through the ZPF, the ZPF spectrum becomes distorted, and the distortion increases with increasing acceleration. Can the distortion be seen? Yes indeed, but not with one’s eyes, because the energies involved are minute. Although the distortion is small, it is extremely important: our analysis shows that it is the origin of inertia. In an article published last February in Physical Review A, we showed that when an electromagnetically interacting particle is accelerated through the ZPF, a force is exerted on the charge; the force is directly proportional to the acceleration but acts in the direction opposite to it. In other words, the charge experiences an electromagnetic force as resistance to acceleration. We interpret the resistance associated with the charge as the very inertia Newton regarded as an innate property of matter. Note that we do not say, “associated with the mass of the particle.” In our formulation, the m in Newton’s second law of motion, F=ma, becomes nothing more than a coupling constant between acceleration and an external electromagnetic force. Thus what we are proposing is that Newton’s second law can be derived from the laws of electrodynamics, provided one assumes an underlying zero-point field. Our work suggests that the conventional Newtonian idea of mass must be boldly reinterpreted. If we are correct, physical theory need no longer suppose that there is something called mass having an innate property, inertia, that resists acceleration; what is really happening, instead, is that an electromagnetic force acts on the charge inside matter to create the effect of inertia. Indeed, it appears that the more parsimonious interpretation is not even that there is charge lurking “inside matter,” but that there is only charge. The presence of charge and its interaction with the ZPF creates the forces we all experience and attribute to the existence of matter. Our interpretation would apply even to an electrically neutral particle such as the neutron, because the neutron, at the most fundamental level, is thought to be made up of smaller particles called quarks, which do carry electric charge. We have had little to say so far about the second key property for the concept of mass, the gravitation to which matter gives rise. But experimental evidence shows that an object’s inertial mass, or its resistance to acceleration, is equivalent to the object’s gravitational mass, or its mass in a gravitational field. Einstein’s general theory of relativity is based on the assumption that inertial and gravitational mass are equivalent and indistinguishable-the so-called principle of equivalence. Hence it stands to reason that if the ZPF gives rise to the phenomenon of inertia, it must also in some way generate the effect of gravity. This audacious idea was proposed as early as 1968 by the Russian physicist and dissident Andrei D. Sakharov, but he never fully developed the concept into a scientific theory. In 1989 the idea was taken up by one of us (Puthoff) and formulated within the framework of stochastic electrodynamics into a preliminary but quantifiable, nonrelativistic representation of Newtonian gravitation. The underlying principle is remarkably intuitive. If a charged particle is subjected to ZPF interactions, it will be forced to fluctuate in response to the random jostlings of the electromagnetic waves of the ZPF. Moreover, since the ZPF is all-pervasive, charged particles everywhere in the universe will be forced to fluctuate. Now a basic result from classical electrodynamics is that a fluctuating electric charge emits an electromagnetic radiation field. The result is that all charges in the universe will emit secondary electromagnetic fields in response to their interactions with the primary field, the ZPF. The secondary electromagnetic fields turn out to have a remarkable property. Between any two particles they give rise to an attractive force. The force is much weaker than the ordinary attractive or repulsive forces between two stationary electric charges, and it is always attractive, whether the charges are positive or negative. The result is that the secondary fields give rise to an attractive force we propose may be identified with gravity. It is important to note that the fluctuations are relativistic — that is, the charges move at velocities at or close to the speed of light. The energy associated with the fluctuations — which for historical reasons is given the German name zitterbewegung, or trembling movement — is interpreted as the energy equivalent of gravitational rest mass. Since the gravitational force is caused by the trembling motion, there is no need to speak any longer of a gravitational mass as the source of gravitation. The source of gravitation is the driven motion of a charge, not the attractive power of the thing physicists are used to thinking of as mass. 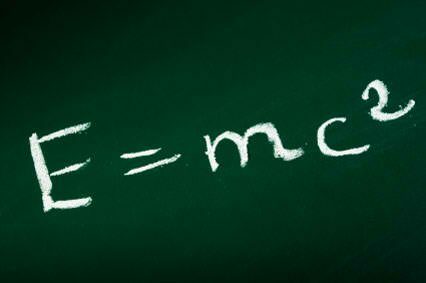 To interpret Einstein’s equation E=mc2, we would say that mass is not equivalent to energy. Mass is energy. Naturally there are a host of objections that have been or can be raised to our radical interpretation of mass. One important objection is that for gravity our model so far is nonrelativistic, whereas the zitterbewegung motions are relativistic. Another possible objection is that we treat the ZPF as real, not virtual, as conventional quantum theory does-even though real, measurable forces can be attributed to it. One such force is the so-called Casimir force between two parallel plates. It is also claimed that if the ZPF really exists, it would be such an enormous source of gravitational force that the radius of curvature of the universe would be several orders of magnitude smaller than the nucleus of an atom. Of course, such a conclusion directly conflicts with everyday experience. The fallacy in the argument is that in the Sakharov-Puthoff model the ZPF as a whole would not itself gravitate. The gravitational force results from perturbations of the ZPF in the presence of matter. In the Sakharov-Puthoff model, then, the uniform ZPF is not a gravitational source and hence would not contribute to curving the universe. A third large question also remains to be answered. How can our theory of Newtonian-like gravity be reconciled with twentieth-century measurements of effects predicted only from general relativity? How, for example, can our theory account for the gravitational deflection of light, the measurement of which in 1919 served as the first proof of general relativity? On that point we can only conjecture. Sakharov suggested accounting for the effects of general relativity by introducing the concept of an “elasticity of space,” analogous to the well-known curvature of space-time. The answer could also lie in the proper treatment of the so-called Dirac sea of particle-antiparticle pairs. The question of general relativistic effects, however, is a valid concern that legitimately challenges the interrelated ZPF concepts of gravity and inertia. Serious as the objection appears to be, we propose that it is prudent to suspend judgment. A great deal of work lies ahead to test and refine our concepts. We and others will continue to study the problem, and in due course the theoretical foundations of those proposals will either be verified or be shown to contain some irreparable flaw. As controversial as the ideas and their implications might be, however, we are encouraged that we are on the right track because of a second analysis now being carried out by one of us (Rueda). In the new analysis it appears that you obtain the same electromagnetic relation between force and acceleration as you get in the original analysis, yet the approach is entirely different. We also submit that a theory that offers new insights with elegance and simplicity is a compelling approach to reality, and we suggest that our view of inertial and gravitational mass has a certain elegance and simplicity. If our ideas prove to be correct, they will point to revisions in the understanding of physics at the most fundamental level. Even if our approach based on stochastic electrodynamics turns out to be flawed, the idea that the vacuum is involved in the creation of inertia is bound to stay. Perhaps even bolder than the concepts themselves are their implications. If inertia and gravity are like other manifestations of electromagnetic phenomena, it might someday be possible to manipulate them by advanced engineering techniques. That possibility, however remote, makes a compelling case for pressing on with the work. Bernard Haisch is a staff scientist at the Lockheed Martin Solar and Astrophysics Laboratory in California and a regular visiting fellow at the Max-Planck-Institut fuer extraterrestrische Physik in Garching, Germany. Alfonso Rueda is a professor of electrical engineering at California State University in Long Beach. H. E. Puthoff is director of the Institute for Advanced Studies at Austin, Texas.